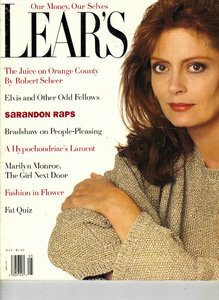 Lear's was a monthly women's magazine, intended for women over 50. It covered celebrity interviews, women's issues, and many progressive issues. Its slogan was "For The Woman Who Wasn't Born Yesterday". It was published from 1988 until early 1994. The magazine was based in New York City. Lear's was founded by Frances Lear, and was designed for readers similar to herself. Having received a divorce settlement reported at $100 million, Lear could afford to run the magazine the way she wished. The first issue appeared on February 23, 1988. Lear's was published on a monthly basis. Because the magazine carried very little fashion coverage, it did not have a natural advertising base, and potential advertisers had difficulty identifying exactly who the readers were. Lear's circulation was audited at 503,000 when it closed, with a median age of 45.3. It was not an industry secret that Sheldon Schorr was brought in to wind the publishing entity down. Schorr did state in an industry conference, "Lear's could have been successful if Ms. Lear provided a better marketing and advertising opportunity to the 35-54 women of America." He claimed that "the staff was bloated and Lear wasted more than a hundred thousand dollars every month." He then took less than thirty days to shut the publication down. Although there were interested publishers to take over, Lear would not permit Schorr to make a deal because her name on cover made her "eternally vested". When Lear's closed in 1994, the executive director Evelyn Renold said "A lot of us feel that we have done our very best work at this magazine. We put out a smart, stylish magazine for grown-up women, and I feel there is nothing quite like it out there now." ^ a b "Lear's Magazine Is Closed". The New York Times. March 11, 1994. Retrieved November 7, 2015. ^ a b Kathleen L. Endres; Therese L. Lueck (1995). Women's Periodicals in the United States: Consumer Magazines. Greenwood Publishing Group. p. 192. ISBN 978-0-313-28631-5. Retrieved 7 November 2015. ^ a b Denny Hatch (June 30, 2015). "The Life and Death of Lear's". Target Marketing. Retrieved February 14, 2016. ^ a b Deirdre Carmody (March 14, 1994). "Why the Plug was Pulled at Lear's Magazine". The New York Times. Retrieved November 7, 2015. ^ a b Mryna Oliver (October 1, 1996). "Frances Lear; Founder of Women's Magazine". Los Angeles Times. Retrieved November 7, 2015. This page was last edited on 16 January 2018, at 06:37 (UTC).